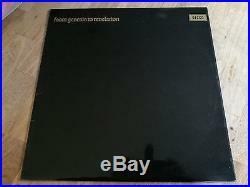 Génesis – Genesis: 1983-98 [New Vinyl] Hong Kong – Import. Artist: Génesis Title: Genesis: 1983-98 Item Condition: New and unplayed Format: Vinyl Release Date: 2015 Label: EMI UPC: 602537850181 Genre: Rock. Album Tracks DISC 1: 1. That’s All 3. Home By the Sea 4. Second Home By the Sea 5. Takin’ It All Too Hard 7. Just a Job to Do 8. It’s Gonna Get Better DISC 2: 1. Tonight, Tonight, Tonight 3. Land of Confusion 4. In Too Deep 5. Anything She Does 6. Throwing It All Away 8. The Brazilian DISC 3: 1. No Son of Mine 2. Jesus He Knows Me 3. Driving the Last Spike 4. I Can’t Dance 5. Never a Time 6. Dreaming While You Sleep DISC 4: 1. Tell Me Why 2. Hold on My Heart 4. Way of the World 5. Since I Lost You 6. Fading Lights DISC 5: 1. Calling All Stations 2. Not About Us 6. If That’s What You Need 7. The Dividing Line 8. Uncertain Weather DISC 6: 1. There Must Be Some Other Way 3. One Man’s Fool Lavishly packaged six 180 gm vinyl LP box set comes complete with high-end reproductions of the inner and outer sleeves, exactly as originally released. Also includes digital download. Each LP has been remastered at half-speed by Miles Showell from Abbey Road Studios. 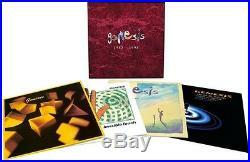 Contents are Genesis (1 LP vinyl), Invisible Touch (1 LP vinyl), We Can’t Dance (2 LP gatefold vinyl) and Calling All Stations (gatefold with 2 vinyl LPs featuring music on sides 1-3 and an etching on side 4). This third box, which comes in a smart red outer casing, follows Genesis: 1970 – 1975 (The Green Box) and Genesis: 1976 – 1982 (The Blue Box) and completes a set that brings together all of Genesis’ studio albums on vinyl. The item “Génesis Genesis 1983-98 New Vinyl Hong Kong Import” is in sale since Tuesday, January 31, 2017. This item is in the category “Music\Records”. 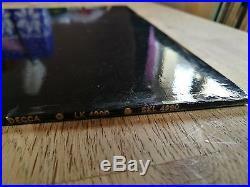 The seller is “get_importcds” and is located in Sheperdsville, Kentucky. This item can be shipped to United States. Hi again everyone yes here we go again. Please note I only ever grade a record mint if its sealed. Title:From Genesis to revelation. 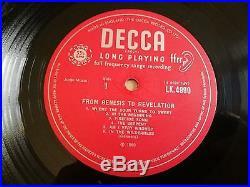 Label:UK Decca Mono 1st press with 1B ending matrix numbers has to be the rarest Genesis lp to find rarely appears. Play grades:Played on my high end clearaudio system and its a wonderful play copy you will not be disappointed with this one. 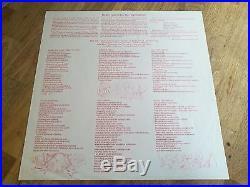 Vinyl Visual:VG+ 1 side & VG the other its not knackered its a presentable copy. Front cover:NEAR EX lovely cover you will struggle to find a better one. Back cover:Same as front cover. Insert is NEAR MINT. 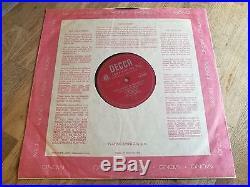 Decca mono inner sleeve. Terms of sale please read carefully. 1:All records are graded under a Policemans home office torch NOT daylight so accurate visual description assured. Here i grade properly, and VG+ or VG does not mean its knackered, I grade in line with UK record collector grading system as follows. = Mint: Never been played or item still sealed. Cover and any extra items such as lyric sheet, booklet or poster (ie contents) are in perfect condition. = Near Mint: In brand new condition with no surface marks or deterioration in sound quality. Cover and contents nearly perfect. = Excellent: Shows some signs of being played but there is very little lessening in sound quality. Cover and contents might have slight wear and/or creasing. = Better than Very Good: Obviously been played but no significant deterioration in sound quality despite light surface marks. Very little wear and tear on cover and contents, without any major defects. = Very Good: Obviously been played many times but no major deterioration in sound quality despite noticeable surface marks and occasional light scratch. Normal wear and tear on cover or contents, without any major defects. = Better than Good: Sound quality has deteriorated but with no distortion. Light scratches and occasional mild scratch. 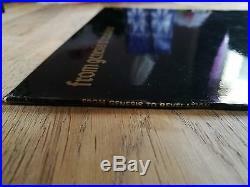 Cover and contents suffer from folding, scuffing of edges but not spine splits or discoloration. = Good: Sound quality has noticably deteriorated, perhaps with some distortion. Cover and contents suffer from folding, scuffing of edges, spine splits, discoloration etc. Still just playable but has not been cared for properly and displays considerable surface noise – it may even jump. Cover and contents will be torn, stained and/or defaced. Will not play properly due to scratches, bad surface noise etc. Cover and contents will be badly damaged or partly missing. Please note once the parcel weighs over 2 kilos the price changes please contact me for details on this. 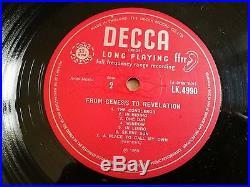 The item “Genesis LP From Genesis to revelation UK Decca Mono 1st press & insert HOLYGRAIL” is in sale since Monday, March 06, 2017. 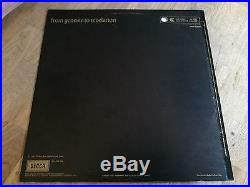 This item is in the category “Music\Records\Albums/ LPs\Rock\Progressive”. The seller is “goonandspeakyourmindletsfindoutwhatitisyouhavetosay” and is located in somerset. This item can be shipped worldwide.